Minor spoiler points in review. This is one of the most unusual novels I’ve ever read, and I mean this in a good way. We’ve all grown up with the legends about King Arthur, Merlin, Lancelot, Guinevere, and of course, the famous sword Excalibur, but I bet no one has read this version. Most have heard how Mordred—Arthur’s greatest enemy—was able to deliver Arthur a killing blow at the same time Arthur used Excalibur to strike down Mordred. It would appear both of these men were destined to die. But what if instead, Merlin used his great magical power to put Arthur into a deep sleep? It could raise all sorts of interesting questions, one of which we read about in this novel. After sending Arthur into a deep magical sleep, Merlin spends the next fifteen hundred years being reincarnated over and over again, though not as human until the last. At one time or another he has been just about every kind of living thing known to man, including leaves, worms, and of course, an assortment of animals. During these many long years Merlin has had several bad experiences from the teeth and claw end of cats and he has learned to hate them with a passion. I don’t want to give too much away, but Merlin’s intense dislike of cats will play an important (and amusing) part of the whole story. 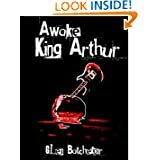 I thought it was clever on the author’s part to have each of the important characters from King Arthur’s past come together again when Arthur awakes after his enchanted sleep. We meet up again with modern-day versions of Lancelot, Guinevere, Merlin, and even Excalibur—only the famous sword is no longer a sword, having been broken during his last battle with Mordred. Merlin must weave his magic once again and molds the broken pieces of Excalibur into an electric guitar. Only Arthur is able to play the magical chord that can influence people when he joins up with a punk rock band, until our modern day Lancelot gets hold of another version of Excalibur, one with an evil chord that could work to change everything if he’s allowed to play it. Even Mordred makes another appearance, nothing changed about his evil objective. All in all I have to say I had a lot of fun reading this quirky re-telling of an old legend. It is a fast, fun, creative tale that I can easily see both adults and YA readers enjoying. It brought me back to the days when I was more willing to set my imagination free and run with the characters as I turned those pages. Posted by Denna Holm on September 4, 2012 in Archives and tagged Excallibur, fantasy, Guinevere, humor, King Arthur, Lancelot, legends, Merlin, punk rock.